Sandwell and West Birmingham Clinical Commissioning Group celebrated 70 years of the NHS on the 5 July 2018. We were delighted that the Birthday party was attended by the Mayor of Sandwell, Councillor Joy Edis to officially open the party together with Deputy Mayor of Sandwell, Councillor Carol Goult. 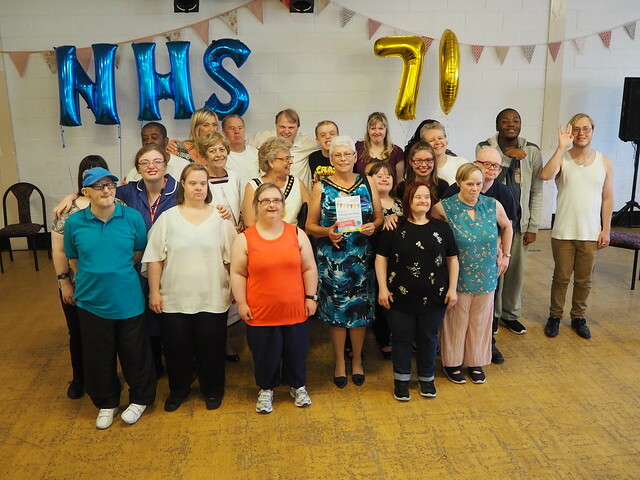 To celebrate, a vintage style tea party was organised at the CAP Centre, Windmill Lane, Smethwick and GP Patient and Participation Group (PPG) members, Patient Network members, local dignatories and staff were invited the event. Afternoon tea was served to guests on vintage china and cake stands by CCG staff who had dressed up in 1940's style clothing with accompanying aprons. The entertainment was provided by ‘Diamond Drama' who are part of Sandwell Day Opportunities project. Sandwell College put together a playlist for the tea party to play at the which was a great hit with people attending the party. Dr Inderjit Marok (Father) and Dr Parmjit Marok (Daughter) from Rotton Park Surgery gave a brief talk on their own experiences of training and working in general practice over the years. Professor Nick Harding (Son) compared the event and also in attendance was his Father, Dr Keith Harding. We also had a local gentleman who turned 70 on the 5 July, so we all sang Happy Birthday and presented him with a celebratory cake. Why are we celebrating 70 years of the NHS? To thank NHS staff for their hard work and commitment, profiling their skills, experience and successes and celebrating their diversity, whilst recognising the challenges they face – this includes volunteers, NHS charities and social care staff, as well voluntary sector, social enterprise and charity partners. To look back over the last 70 years of the NHS celebrating key clinical, technological, scientific, medical and workforce developments and breakthroughs. To look forward and build confidence amongst staff and the public about the NHS’s long term future, recognising that the way care is delivered will continue to evolve, with a particular focus on innovation and technology. To support a public conversation about the NHS of the future and to develop an archive of staff and patient stories for future generations to engage with. To allow people to connect with, and understand better, their local NHS through a range of NHS70-themed events, exhibitions, awards and other initiatives.